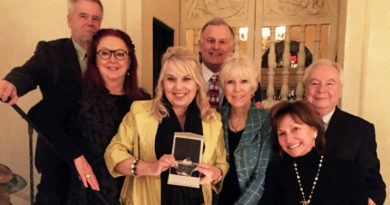 With the State Fair of Texas’ recent announcement of eight finalists for the coveted Choice Awards, competition is heating up. These eight finalists are fine tuning their fried food skills for the big announcement of two winning entries August 28. Celebrating more than a decade of fried food decadence, the State Fair of Texas and the Dallas Convention & Visitor’s Bureau will present another year of culinary creations at the 12th Annual Big Tex® Choice Awards. Fairgoers enjoyed a behind-the-scenes look into the annual event with the unveiling of the exclusive list of semi-finalists. Thirty four concessionaires and their original creations were chosen to continue on to the tasting round, where they were evaluated on four finalist-worthy elements: uniqueness, creativity, presentation, and of course, taste. After deliberation, votes have been cast and the results are in. With an impressive 55 entries to choose from this year, only the eight most decadent dishes earned the right to be tested by the celebrity judges. Even if an entry didn’t make the final cut, concessionaires can still choose to introduce their creation as a “new food” during this year’s Fair. Bringing a taste of Caribbean flare to the Fair, this dish stands out among the rest with its profile of fresh flavors. Marinated grilled chicken and shrimp are served over a bed of yellow Caribbean fried rice and topped with a tropical salsa and pineapple rum glaze. 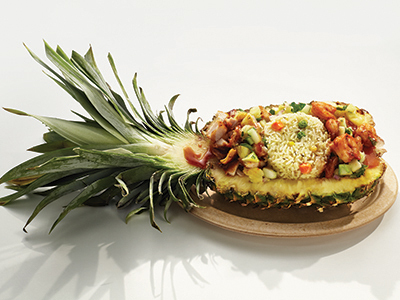 Served in a pineapple half shell, this Korn-a-Copia will have you ready for a day at the beach… or a day the Fair! Meat lovers are in for a treat with this tantalizing triple threat. A miniature, handmade seasoned ground beef patty is stuffed with shredded cheddar cheese, bacon, and an all-beef hot dog on a Hawaiian roll. It is then placed on a skewer topped with a pickle, dipped in a tempura batter and deep fried to perfection. Every Bacon Burger Dog is served on a bed of shoe string fries with ranch dipping sauce. Putting a tasty spin on a pantry staple, the unique combination of flavors in this deep fried dish create the perfect balance of sweet and savory. A “FUNYUN,” the traditional crunchy snack, is stuffed with pulled pork, pepper jack cheese, pineapple slices and bacon. It is then dipped in a flavorful batter and deep fried. Each order is served with a multilayered sweet BBQ sauce. Two classic American comfort foods, one mouth-watering meal! This ultimate taste extravaganza starts with a savory cream sauce chock-full of shredded roasted chicken breast, tender diced white potatoes, sweet carrots, peas, corn and a special blend of herbs and spices. This hearty filling is ladled into fresh, flaky pastry dough and then gently folded “hot pocket” style. Each bite of the deep fried, golden brown, buttery crust is bursting with a savory sauce of chicken and veggies. Pure down-home goodness! Served with a side of mac ‘n cheese-inspired dip, this unique sharp cheddar sauce creates a tantalizing flavor combination. For the first time in Big Tex Choice Awards history, America’s favorite childhood dessert is given a State Fair of Texas twist! 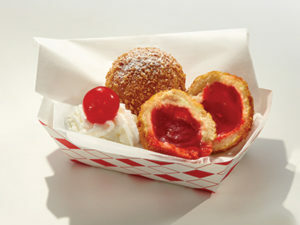 A classic cherry-flavored Jell-O in a panko-crusted breading, flash-fried to perfection, and then dusted with powdered sugar. Prepared with a tasty topping of whipped cream and a cherry garnish, this dish has the perfect amount of crunch to compliment the jiggle. Smoke-crusted BBQ beef brisket is hand shredded with bock BBQ sauce and molded to form balls. The ball of beef is then breaded with seasoned bread crumbs and deep fried to a crispy perfection. Served on top of a bed of coleslaw, each order comes with its own pipette of bock BBQ sauce to be injected into the brisket balls. Guaranteed to be a perfectly succulent bite every time. Putting a modern twist on a traditional Deep South favorite, this southern fried dish is a two-in-one hit! Juicy shredded chicken is mixed with bits of signature seasonings, dough and a touch of gravy. This decadent mixture is then rolled into balls, coated with bread crumbs and deep fried golden brown! Served with fried “biscuit bites” and a side of gravy, this dish is truly comfort food heaven! A unique play on America’s favorite savory side dish. 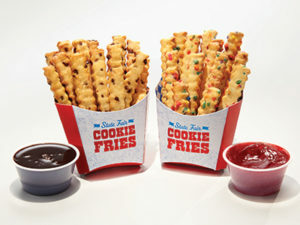 The cookie fry may look like it needs ketchup, but don’t be fooled by the classic crinkle-cut appearance. Offered in traditional cookie flavors like chocolate chip or sprinkles, these sweet treats are served with your choice of the accompanying strawberry or milk chocolate sauce. Just consider it an undercover cookie in fry-form disguise. Mark your calendar for the 12th Annual Big Tex Choice Awards on Sunday, August 28 at 2 p.m. in the historic Tower Building at Fair Park. Get your ticket today and be one of the first people to get a taste of the 2016 food finalists. Tickets are available online for $100, with a limited amount of seats available. Don’t miss out on the fun – buy your ticket now before they’re gone! All proceeds from the Big Tex Choice Awards ceremony will be donated to the State Fair of Texas Youth Scholarship Program. Over its 24 year history, the Youth Scholarship Program has awarded scholarships to more than 1,800 students for a total of more than $8.7 million. Eligible recipients include graduating high school seniors from around the state of Texas who have competed in State Fair livestock events, as well as graduating seniors from five Fair Park area schools – Irma Lerma Rangel Young Women’s Leadership School, James Madison, Lincoln, North Dallas and Woodrow Wilson High Schools. 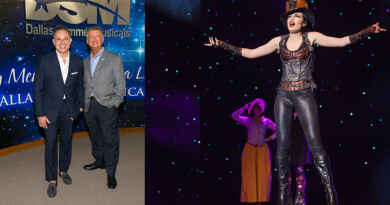 Due to the event’s charitable cause, a portion of each ticket is tax-deductible. 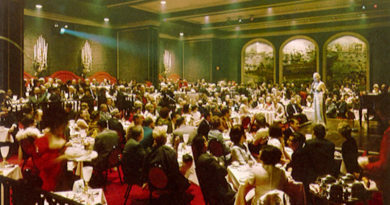 The Venetian Room at Fairmont Dallas Needs Your Memorabilia! September 6, 2016 JoAnn Holt Comments Off on The Venetian Room at Fairmont Dallas Needs Your Memorabilia!